1) Peel has outlined that its plans will make Liverpool the rival of Shanghai and New York. Both of these cities have populations of more than 8 million people, Liverpool's is less than half of one million and declining. How will the city be able to support such a huge development of high-rise buildings? In such a small city, is there an economic need for so many skyscrapers? 2) Peel has said its proposed developments will put Liverpool 'on the map'. Liverpool already has a world-famous skyline, judged by UNESCO to be a World Heritage site, is Peel not afraid its plans could overshadow this heritage? 3) The scale of the development is undoubtedly huge, could it in effect create a 'new' Liverpool away from the heart of the current city? 4) Can you tell me more about Peel's ideas for the new skyscapers to be self-sufficient in producing energy? Is this a concept that Peel will hope to be incorpating into all of its developments? Obviously, environmental concerns are are high up news agendas of late and this must affect Peel with the company's ownership of several airports. 5) How confident is Peel that in fifty years time, Liverpool will look like it has envisioned in its promotional video for the city? "We are currently undertaking research and studies to ensure that what we propose is for the benefit of Liverpool. At the moment it is a vision that we believe will become a reality. All your questions and more will be addressed over the next 12 months"
I am just wondering what your feelings are on these issues? My feelings are that the population of inner city Liverpool is far from declining after the mass exodus from the 60s to the 80s. Albeit, a lot of the current city centre population is student based but that again shows confidence in our city and inner city living, whether it be outsiders or locals is definitely back in vogue again - again, a mass turnaround from 1980s policy. Peel as a private Company, ie. pumping their own money into these developments, should be encouraged, they are unlikely to want to flush money away on something they don't see as feasibly or sustainable and again, as with Grosvenor, it's private investment so some big money people are obviously seeing something in the city's future which after all, is what manchester has been doing for years so if we don't want to slip even further behind we have to move with the times and not stagnate. The likes of the rope walks, the old docklands and delapidated brown field sites have seen a renaissance in recent years and i'm all for it. I am also "just wondering" if you are another troll from up the motorway? You see, my suspicions are naturally aroused when you have also answered most of the queries you, yourself, have posed. By-the-way, metropolitan Shanghai has a population in excess of 20 (twenty) million people. The figures you quote for New York includes the whole population of the five boroughs. Liverpool's population is no longer in decline and is, indeed, climbing and has been increasing over almost the whole of the last decade. The University of Salford, on their web site, gives the figures thus: Liverpool 469,017 to Manchester's 394,269. Visit the site and you will see the figures for yourself. Last edited by Sloyne; 05-03-2007 at 04:15 PM. I suppose a 'Derelict Dock Area'....Would be far nicer??/!!!! I am not a 'troll' from Machester, thank you, I am from Liverpool. I was born in Liverpool, live in Liverpool, studied in Liverpool and work in Liverpool. I have not answered my own questions and the only motivaton I have for asking them is to get a response. My personal beliefs do not come into it. Whatever questions the Echo didn't ask, I would like to ask them. Somebody has to. If you read the questions properly, you will see they come from concern for my home town. Peel's suggestion that their plans would but Liverpool 'on the map' is somewhat arrogant. My question was intended to inquire as to why they do not believe it is 'on the map' already. Ergo the question about creating a new city centre. I also dispute your figures for the Shanghai and New York populations. Last edited by Sloyne; 05-03-2007 at 04:47 PM. Dispute as much as you want, the figures are taken from official sources. The NYC figures are from their own web site and the Shanghai figures are from the UNESCO, Lonely Planet and Wikepedia web sites. The last full census of Shanghai was in 2001 when it's population was 17 million. Figures aside anyway - what's the alternative - do nothing. What if Peel were pumping this money into Leeds, Birmingham, Manchester - we'd be saying why not us? When they're pumping that much money in they can say what they want as far as i'm concerned but yes, I do think we are on the map already but i'd say try and watch people ignore us when these developments take hold - the rest will be rightly jealous. Besides, I am not looking to nit-pick over these kinds of figures! Just hoping to get your views to inform my article further. If Liverpool thinks big enough this will put us back in the big time. We must be allowed to air our thoughts. I've seen too many wonderful schemes come, and then go. I don't want to be a wet blanket, but when I first saw the renders for this, I thought (to put it mildly) that it was rather ambitious, as I did the plans for the Wirral. Have we come any further than vague promises? It would take 5 years just to get outline planning permission,this is a long term project,a downturn in the market could see this project stop completely and resume again when it becomes more buoyent. John Whittiker's Peel Holdings have an excellent track record on delivering projects, from proposals to finished product. We have seen the results in Peels ports, airports and property developement. Sceptics said that they, Peel, would close the ship canal to commercial traffic and build condo's on the land. Instead we have seen the expansion of traffic and solid proposals for an inland container terminal at the Salford dock basin terminus. The Doncaster (Finningley) airport, contrary to pronouncements by those same sceptics, is now handling commercial aviation traffic and the post-Panamax berths on the Mersey, since government approval, are already in the planning process. Liverpool is a world wide recognised brand and was before Peel bought the MD&HC. Liverpool's recognition outside the UK is second only to that of London and yes, it is presumptious of Peel to infer that their scheme will put Liverpool on the map. But hey! isn't the revision of history to their own benefit ,a Manchester trait? Without waiting years for outline planning for the whole site, Peel can continue to develop Princes Dock, with Plot 3a in with the planners and now the yachts we might just get some progress on the 50 storey tower proposed for the middle of the half tide dock. Last edited by woody; 05-05-2007 at 12:11 AM. I've just watched Jonathan Meades programme "Abroad again" with his take on urban regeneration and sense of place. My jaw dropped as this ***** rambled on about the 1980's, unemployment, riots, strikes etc, etc. I was so angry, I had to go out for walk to calm down. It must have took this ar**h*le whole seconds to research the programme. The point I'm making is, he was walking around the filth and dereliction surrounding the Stanley Dock warehouses commenting on places that live in the past and rely on funding for everything and I realised that this is STILL how people see us, it will never change as long as we continue to cling on to the past like a lifebelt. The likes of this scheme MUST go ahead. If I was running the show, I'd have the whole lot bulldozed tomorrow and start on the skyscrapers immediately. Who will live in them? We'll cross that bridge when we come to it. Constantly living in the past and finding barriers to prevent progress will kill us dead. I'd rather see a row of empty skyscrapers than the pathetic remnants of filthy, dead industry anyday. Jonatham Meades style is to entertain us with his own idyosyncratic take on something face to camera. I didn't see the programme but from what you write you are probably right to say that this is how SOME people see us. Other people see us differently. What matters is how we see ourselves (and this will also be comprised of differing and conflicting views). If we are reduced to dressing the city up/knocking it down to build 'modern' skyscrapers to gain the approval of others then we may be in danger of losing more than we gain. Personally I would sacrifice every building built in the last ten years to see the Tobacco warehouse brought back to life. My preference would be to see it in the public realm rather than stuffed full of 1 & 2 bedroomed apartments but I know that's wishful thinkng! People say lots of things about Liverpool, some of the things that are said can be pretty nasty. Sometimes people can be so glowing in their accolades that I wonder if they are talking about the city I live in. Liverpool is out there in the world's imagination as it has been for over 200 years or so. During that time we have been portrayed as being up there with New York and London and a bankrupt, derelict city full of scallies and workshy people living on the soc, and everything in between. Let's not worry how Jonathan Meade sees us but concentrate how Beetham, Grosvenor, Peel etc see us as they're the ones putting private investment into the city. Look at how the Albert Dock, Wapping and Waterloo warehouses and other 'scrapheap' old buildings have been brought back to life and yes, compliment these with the skyscrapers but let's not have a kneejerk reaction where we become like the time machine where everything goes to be replaced as not everything is unsalvagable. For example to fill in docks of the past and not utilise structurally sound buildings with history and prestige like the tobacco warehouse would be as criminal as what Meade is broadcasting but yes, the quicker the better we move on up. The city is certainly in danger of having, as someone once commented, "more past than future." The buildings that have been preserved and put to a good use in the Albert Dock are fine but I think we should draw a line under preservation now and concentrate on making the city look like it's in the 21st century and not the 19th. The Tobacco Warehouse, really is a candidate for demolition - it's an ugly industrial building with no merit which would not really convert to anthing else. Just because something has been standing for a century or so does not make it indespensable and we have to learn to let go of the past. Seen from the Wirral side, the north waterfront beyond the Princes Dock is in desperate need of a facelift and I would welcome a develpment on the lines of the projected one shown recently in The Echo. Instead of it being office space it could be genuinely affordable housing. The overgrown Garden Festival could be put to the same use if it's never going to be improved from it's current state. Liverpool must preserve its past as well as continuing to grow as a 21st century city. The plans outlined by peel are great and the MD of the company seemed genuinely commited in creating a high quality and stunning development. I do think the stanley dock warehouse should be renovated, but is one of only a couple of buildings worth saving. The rest of the site should be bulldozed and Peel's plan should move forward as quickly and thoughtfully as possible. I think that Liverpool has the real potential to become a major world city with the history and ambition for the future to match. We do have to start thinking more of the future and a bit less of the past, but we must always remember our heritage and history wether it be good or bad. I know that Liverpool is a great city no matter what some people may say. We have our bad points just like anywhere else and people who choose to think of us as a bunch of workshy scallies have the right to think that, but they are wrong and are simply jealous of what we have achieved and what we are going to achieve in the future. Birdseye, the garden festival site is currently under renovation which will include some apartments and the restoration of the gardens which will be fully open to the public. Is all that's required for the Tobacco warehouse. It is the largest brick built structure still standing and is grade II listed - why lose the footprint of it to another glass and steel structure when there's plenty of avaialble land where the summer pops tent used to go nearby. I would have the large ground floor areas, currently taken up by the market either as a permanent market (not just one day a week like now) or use the space as a large objects museum, open for the public, unlike being hidden away in Bootle in a warehouse at present. It has been vetted that every other floor in the upstairs part of the building could be taken out to alter them into apartments. As soon as the canal link across the Pier Head opens, millions of visitors will pass by the tobacco warehouse via the canal at Stanley locks. Why lose part of our heritage for nothing. Don't Liverpool City Council have a department that deals with the media and can stop this type of nonsense? Peel's Liverpool and Wirral Waters. An other things like the North West Gateway. ONE of the region?s largest developers yesterday warned it would pull out of Merseyside?s biggest-ever regeneration scheme if the Government calls a public inquiry into it. Peel Holdings? development director, Lindsey Ashworth, said the planning regime needed to be relaxed to ease the progress of the company?s ?10bn Liverpool and Wirral Waters scheme to build dozens of skyscrapers on the banks of the Mersey. ?My view is if it goes to a public inquiry I am finishing, all bets will be off. We will abandon the scheme,? he said. In a rare public address, Peel chairman John Whittaker had earlier called for the North West Development Agency (NWDA) to be handed planning powers over the Manchester Ship Canal corridor where the company is planning ?50bn of investment. Last night, the idea was described by the NWDA?s chief executive Steve Broomhead as an ?interesting idea that was worthy of debate?. Mr Ashworth and Mr Whittaker were speaking yesterday at the official launch of the company?s Ocean Gateway plan. The launch included the start of a two-day swim of the length of the ship canal by Mr Whittaker?s son James, 37, to raise money for a new children?s hospital in Manchester. Starting in Salford?s Media City development, that will see the re-location of BBC departments to the city, the gateway includes a number of schemes along the Ship Canal, culminating in the Liverpool and Wirral Waters scheme. Creating a superport at the Port of Liverpool and harnessing the power of the Mersey for electricity generation are also part of the Ocean Gateway scheme. The company has become frustrated at the length of time it currently takes to get planning permission and wants a special exception to be made for the Ocean Gateway. permission for the Waters schemes, but plans to submit proposals to Wirral Council by Christmas and Liverpool Council next spring. The Waters scheme would see the creation of 40,000 new homes and 50,000 full-time jobs on 320 hectares of redundant docks, on either side of the Mersey, over a 30 to 40-year period. Mr Ashworth said: ?We are trying to bring international business and create new business. ?Vancouver which is now considered the most desirable place to live and work in the world, is a great example of what could happen on the Liverpool waterfront. ?Building small houses on here, it?s not going to happen ? it would not help the local economy. They have got to be tall buildings. ?We are stuck in a planning process that is going to take too long, something needs to happen to make it happen quicker. This scheme does not fit in with national, regional, or local planning policy. ?We are a nation of rules and regulations, and we need to change the way those rules work.? He said different planning regulations were required as the UK appeared to be heading for a recession. ?You need different policies from those that we had in the boom time. ?My view is, if it goes to a public inquiry, I am finishing, all bets will be off. We will abandon the scheme.? He said the idea was not to become a mini-New York or a mini-Dubai. ?It?s about being a place in itself, building something that makes the place individual.? In 2010, Liverpool will have a stand at the Shanghai world Expo ? the world?s largest business fair ? which Peel is sponsoring. ?It would be nice to go there with planning permission and be able to say to the world here is a scheme that has got government approval.? Mr Whittaker said the Ocean Gateway plan was designed to make the North West the most dynamic and economically active region in the UK. ?In an increasingly competitive world, we see the ?North West?s Ocean Gateway? concept as an opportunity to share ideas and attract investment interest to the region. ?I believe this represents a major opportunity to put the North West in a better position to compete internationally and help reduce the North- South divide. ?I believe a central ?Ocean Gateway? branded vision will positively raise the profile of the North West, encourage inward investment and wealth creation and bring with it new people, new businesses. ?We have two great cities in the North West, Liverpool and Manchester, and they stand like bookends on the Ship Canal.? He said they competed for centuries, but about two years ago Manchester edged ahead through adopting an open planning policy. ?Liverpool City Council is getting there, but it should continue to open its doors more and adopt similar policies.? ?The Ocean Gateway concept should have its own planning regime lead by the [North West] Development Agency.? Mr Broomhead said the idea of planning for the Gateway being controlled by the agency was ?interesting?, and ?worth having a debate about?. ?But it would require the full involvement of the local authorities.? Last edited by Waterways; 09-08-2008 at 02:11 PM. That alone looks incredible! I do hope both schemes go ahead. 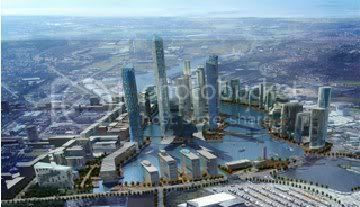 New render of Liverpool and Wirral Waters.